In 2005 Steinbach was pleased to announce a new, exclusive limited edition series, Steinbach Shakespeare Nutcracker Series. The works of William Shakespeare inspired this nutcracker series. The diverse writings of William Shakespeare have enraptured readers for years. 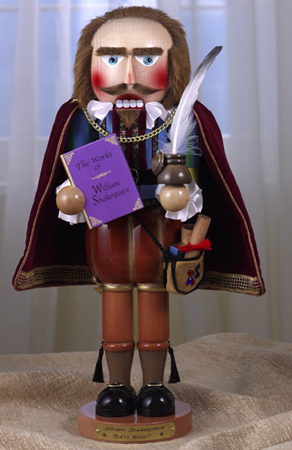 First in the Shakespeare Nutcracker Series is William Shakespeare (ES1751). 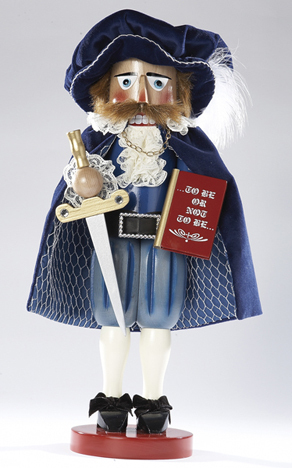 This 17-½ inch nutcracker captures the essence of Shakespeare complete with high forehead, longer hair and mustache. Shakespeare represents the splendor of the century clad in an elegant, burgundy velvet cape trimmed in gold weave. A gold chain keeps it in place under the white ruffle of his collar and black tassels hung from his taupe socks and tan pants. Shakespeare carries a volume of his stories in one hand and an inkwell and quill pen to continue his writing in the other. A pouch with spare scrolls hangs from his belt.